I'm looking into getting an 8 string steel and I found a dual neck 8 string steel. Does have any experience with these and are they alright steels? Any info would be appreciated. Thanks! I have had a T8 National console for about 10 years. I have no complaints except the amphenol jack. I changed mine to a standard 1/4". There are adapters available if you want to keep it original. Yeah I noticed the amphenol jack probably just going to get the adapter. Thanks for the info though definitely will consider getting it. I have a 1949 model 1050. The plastic tuner buttons were in tough shape and I replaced them all. A previous owner had removed the amphenol jack and hardwired a big ugly curly cord. I changed it to a 1/4" jack. But if the amphenol jack had still been there, I would have tried the adaptor route first. I don´t think that you can go wrong with a National if it is in playable shape. Thanks for the link to the cable Michael! Think I'll go with that so I dont have the adapter sticking out. I still have the original cable for my New Yorker that I bought new in 1950. It's cloth covered ! I have one like that with my '47 New Yorker as well! I also have a '54 Grand Console. I just got it up and running with new tuners (I went with metal buttons) and restrung it. I need to get it out of my bass player's basement so I can actually play it! I have an adapter for the plug. Have two National D8's and would not part with either. 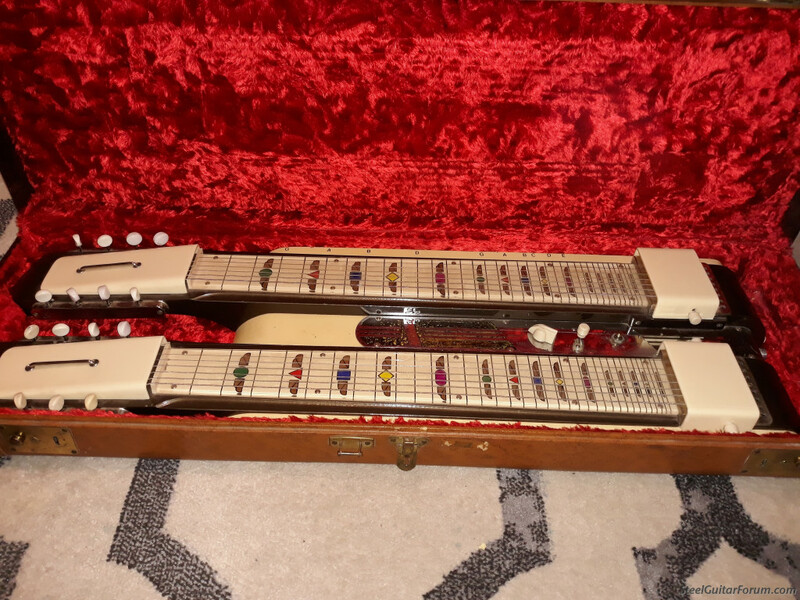 I also have a Rickenbacker 518 triple neck which I hate. Give me the National any day even though mine are microphonic. Tap the leg and you hear it through the amp but I am loath to fix it. I like it when the pick ups start to get "microphonic". I finally got it and I love it! I just got mine home from the bass player's house today! I sat at it for about an hour playing it acoustically and letting the strings get used to my music room. I know I'm going to be spending a lot of time up there with it. I've owned it for a few years now and I'm really happy to have it up and running and getting some sounds that resemble music out of it. I hope the OP gets as much pleasure out of his. I'm looking forward to getting a few tunes under my belt and being ready for HSGA next fall. I'll never be great, but at least I can aim for being pretty good. Hope you enjoy your National again as well I know I sure am going to have some fun with mine. I just wired up two cables with the screw on connector. One six foot the other ten. Plenty long enough to get from the output to the volume pedal, or the amp in a small room. We got a bunch of snow today and more coming in tomorrow. I know where I'll be spending time for the next few days. I hope the neighbors like steel guitar.